The R&T doubles court. Men can play. Sitting somewhere up in heaven, on a mahogany cloud, hovering over the ultimate playground of grown boys—the doubles court at the Racquet and Tennis Club in NYC, I can only wish I was allowed to swing my own racquet in that glorious pearlescent space. But I am a mere mortal . . . and unless I channel my inner-Athena to appear as a man (anyone remember their Homer? ), I am destined to be a Harpy or a Siren, attempting to persuade the gods that life on earth can be entertaining, too. 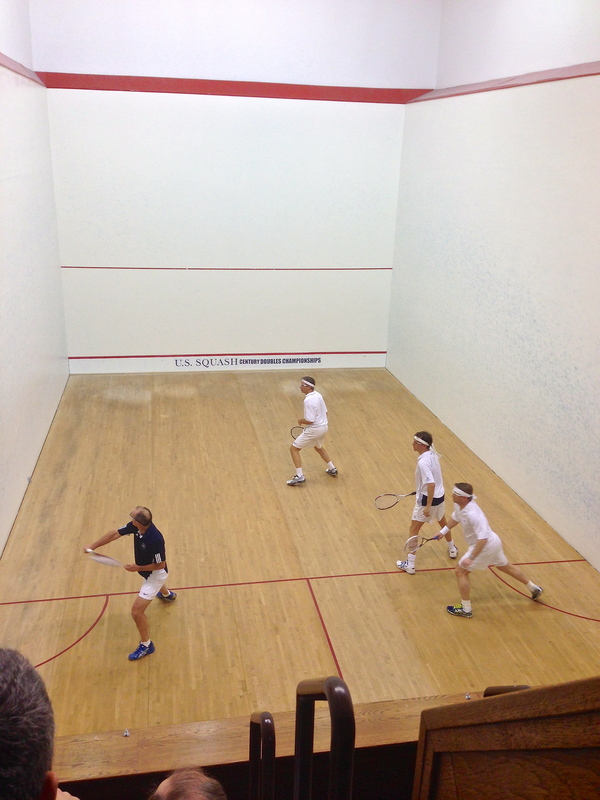 It certainly was this past weekend in the U.S. Century Doubles Squash Championships. And mortals of every age can play; that is the fun of it. You and your partner must add up to a century or more and there are at least half a dozen draws to choose from, from the mostly equal-age A’s to the Grand Master eighty-year olds. As an R&T never-will-be, I played in the women’s (a new but hopefully growing) draw with a Canadian just one decade apart from me. I think we were both grateful for the other’s talents: my fleet squeaky feet enabled her to use her superior shooting skills. Although by Sunday, we were both a little worse for wear, thanks to some Saturday night bacchanalia—yet another popular draw of the Century. As usual, I learned a few new things over the course of this squash-centered weekend, so if you’re considering participating next year (there’s still plenty of time to learn the game), or just desire a taste of a different perspective, here are a few things to consider…. Be dressed for success – to get in the front door of clubs with dress codes. Maybe you’re already an NYC club regular and don’t mind using the service entrance in your warm-ups, but for out-of-townies (or out-of-boroughie, in my case), it’s a chance to gawp at the glamour and old world charm. So while I carry my squash gear on my back, I make sure to wear something with a bit more uptown clout than my usual downtown casual. A fox fur hat does the trick at distracting doormen from my Brooklyn boots. However, I was quite disappointed that my disguise couldn’t be put into play at the one club I had yet to attend. The Union Club, a “gentleman’s club” on Park Avenue was having a black tie ball on the evening of my first match and instead of gliding up the marble steps, I had to duck down a side entrance by the waste storage area, wait for the service elevator, and weave though stacks of banquet chairs to the ‘Ladies Lounge’ which was the size of my bedroom….and I do not have a large one. Later, after thoughtlessly whining about it, I was quite politely informed by a Union Club member that only family-member females play there and only at prescribed times. So best keep my squeaky feet out of my mouth, and next time I’ll just have to pack a gown if I really want to get in the front door. 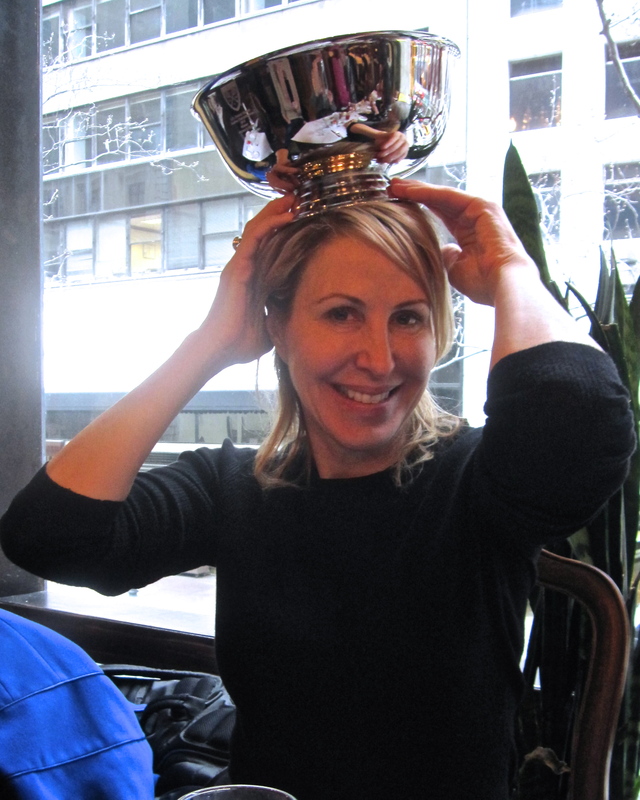 Despite easily winning our first match at Union Club, I was ready to lose our next match at the University Club to a team I knew as awesome singles players. So I was more than a little thrown when we started winning points instead of losing them. Honestly, if I’d been a bit more confidant then I think I would’ve had a silver bowl on my mantle by now and not just a bunch of dusty candles leftover from Christmas. We went to five games and even had a match point in the fourth. But my inner doubting Thomas had left the window open, letting our opponents sneak through to a win in five. Happily, for them, they went on to win the women’s draw which I don’t think we could’ve done. See, there I go again…. Be adaptable. 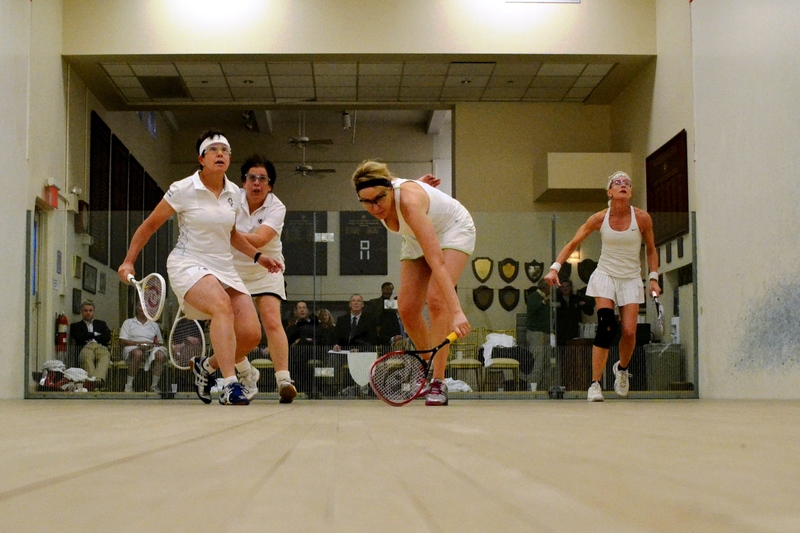 All squash courts were not created equal, but especially not doubles courts. The Union Club’s had high ceilings, but warm air—at least on the evening I was there the radiators were hissing with steam—so the ball slung around as if on steroids. 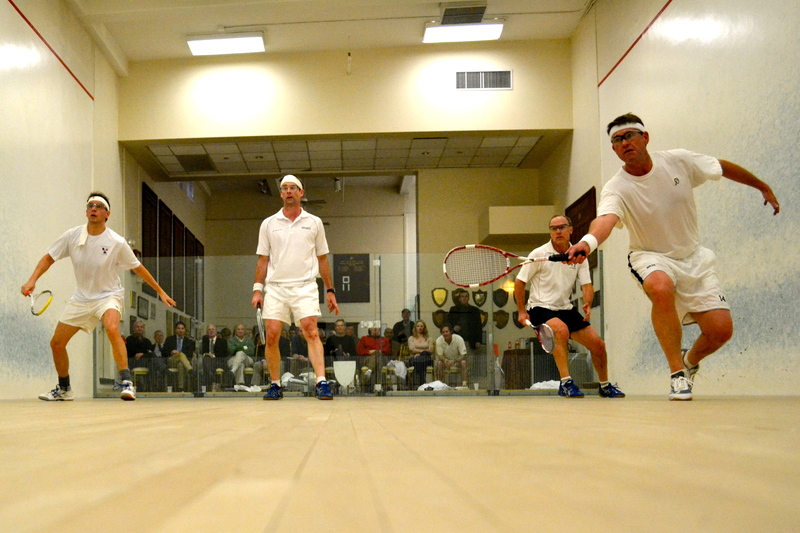 The UClub court has its famously low ceiling that catches anything resembling a lob. And the New York Athletic Club court was so unbelievably arctic that I actually wore my warm-ups for most of the match, which is unheard of for me. The good part was that the ball would go down and stay down….but that proved to work better for our opponents; I’ll be working on my volley drops and trickle boasts for next year. If we were likening courts to bowls of porridge, the one at Racquet and Tennis would be ‘just right’ . . . at least it certainly looks perfect from the choir box above it, with the lovely late winter light filtering down from the skylight above. The semi finalists in the Men’s Open draw were the chosen gods of the afternoon and I watched F&M, R&T, NYC legend Morris Clothier and his super fit partner, Charlie Parkhurst lob it out with the steady swinging Jeff Stanley and sharp shooting James Heldring. Parkhurst takes the ball at R&T as Heldring, Clothier, and Stanley look on. As Eskimos have endless words for snow, there should be just as many to describe the various lobs that both teams used in this lofty space. Besides the predictable underhands, forehands, and volleys, there were flicks and swoops and—my favorite—a front wall facing forehand by the left-wall playing Parkhurst which initially appeared as if it would be easily volleyable, but instead put the ball just over everyone’s heads. It was brilliant for R&T’s airspace, but elicited groans when his muscle memory overrode his short-term memory on the UClub court where he and Clothier advanced to play the finals. Needless to say, the ball kissed the ceiling and stole some of Parkhurst’s confidence. Be creative. This is perhaps what I love most about doubles squash. There seems to be endless possibilities of places to put the ball, how to hit it, and where to hang out on the court depending on whom you’re playing with and against. And while I do love the intensity of a game of singles, it’s a lot more predictable at my level. This was definitely not the case in the one finals match I caught on Sunday between Clothier and Parkhurst and Eben Hardie and William Villari. Or North vs. South (Hardie and Villari hail from Atlanta). With a much lower lid on the court and the loss of the lob shot, the play became even more creative. If you can’t get the ball over your opponent, then it makes sense to get it around your opponent, by hitting more than one wall before it lands, ideally toward the back of the court. But because these shots rarely make a winner, I wondered aloud to an experienced player why they were so often employed. Whomever takes the shot has to process a lot more angles, he basically explained. You’re focusing more on keeping the ball in play than being able to hit a winner. 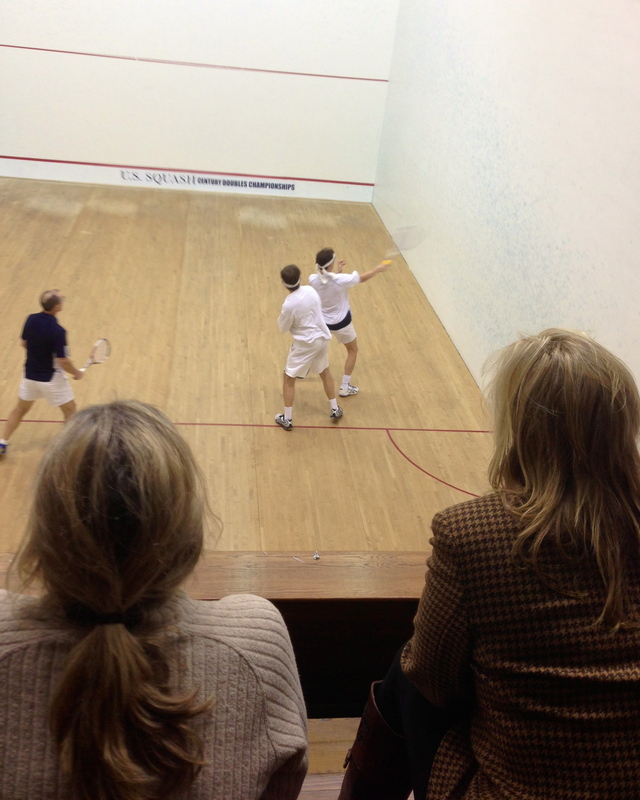 So UClub doubles squash is kind of like a pinball game, I thought to myself. When the ball comes straight at your flipper, it’s much easier to flick it where you want it. But when it’s bouncing all over the place, you’re less concerned with ringing bells and racking up points than you are with merely making a decent flick. (If this is all wrong, it’s because I grew up on Pac-Man.) Coincidentally or not, the player I spoke with went on to win the match with his partner, so I’m taking a page from his book and plan to practice more pinball. I walked to the subway late that Sunday afternoon—my squash bag on my back, my head full of all the games I’d played and watched, my limbs tired and loose—and felt not unlike a kid heading home after a long day spent running around with friends. That’s why we squash players do these tournaments, I guess. We love that fatigued but full feeling. So I expect to see you all next year. Bring some new friends, be they gods or not. See more photos and coverage of the U.S. Century here. How do I know those were women watching at the R&T and not just hippies with long hair? Go Susan Rose. Every princess needs a tiara. A little flashy though. oh joseph, you’re just jealous. Please add this doubles guy to the list. What a difference a week makes. On the golf course in Atlanta today! Send some sun and warm air up here, please. I’m ready for spring in NYC! Good article- entertaining and truthful. Doubles tournaments are FUN. 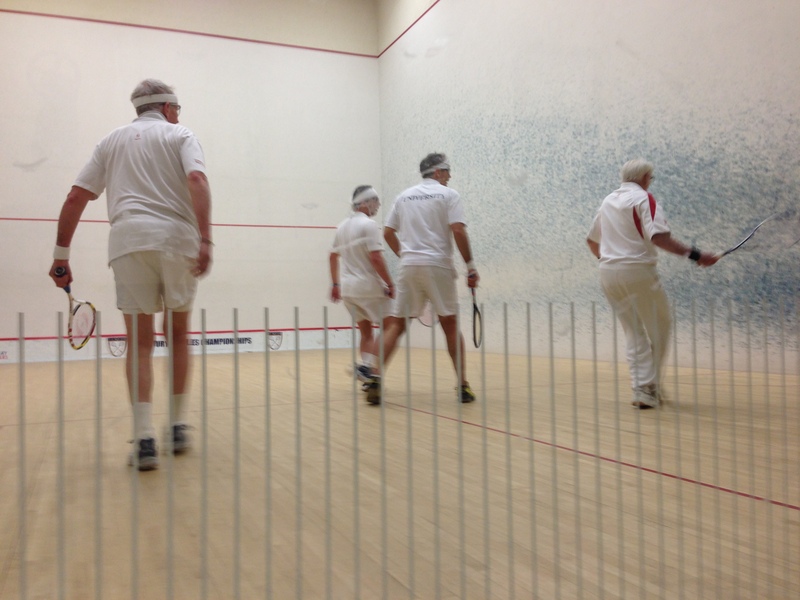 They harken back to The Good Old Days of squash in NYC. Thanks so much. Let’s hope we can keep some of the ‘good old days’ going into the future….